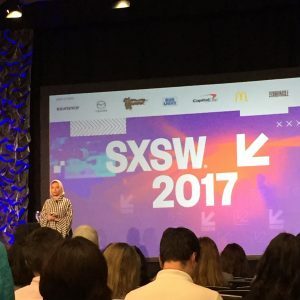 Perhaps it was because it was my first session of SXSWi 2017, or maybe it’s just because I’m great at picking inspirational speakers (see evidence in my first blog post from SXSWi 2016! ), but I found “Everything I Need To Know About Innovation I Learned in Kindergarten” to be a great way to kick of this year’s event. If you think back to the fundamentals of your 5-year-old experience, sharing, learning and making friends were key. And the truth is, those fundamentals remain into adulthood, particularly if you have a business that’s looking to create partnerships. Every speaker was excellent, but I was particularly inspired by Katherine Duong who talked about cultural probe kits and how she’s using those to research various consumer behaviors. From exploring recycling habits to learning about transgender patient experience and internationally determining how seniors are aging in place, these kits employ techniques such as asking people to snap photos, create drawings and even make mix tapes that demonstrate how they feel about or act on a topic. Takeaway message – get outside of your adult self (who is likely more serious and judgmental) and have some fun. You’d be surprised how creative, expressive and authentic you will become – all keys to unlocking success in business. You can never end your education. And while learning a new concept or skill sounds exhausting, it doesn’t have to be. How about offering a 3-minute class, like how to navigate one point of a new online resource, over coffee at your center table? Or, how about creating a Slack channel where employees can post quick tips or links to helpful resources? Tiny bits of information will eventually lead to a rich knowledge base. There are two ways to look at mastery. A) Congrats, you’re an expert! How can you put that to use as a mentor? B) Great job mastering this topic. Now it’s time to learn something new – expand your horizons! Great suggestions to keep employees at all levels moving forward in their career path! Although “Empowering a Billion Women by 2020” wasn’t quite what I expected going in, it was amazing to hear how Ingrid Vandervelt has mobilized major corporations and inspiring individuals to help women get their businesses off the ground or to meet a major growth milestone. Did you know that in the U.S., women oversee 80 percent of consumer spending – to the tune of $3.7 trillion annually? And when women believe that a corporation is authentically trying to help them succeed: 79% will try that product or service, 80% secure their loyalty to the brand that helped them, and 92% pass that information on. That said, less than 4% of women get VC funding, less than 14% sit on boards, and less than 2% of women-owned businesses get over the $1M mark. If those statistics are frustrating to you, check out EBW 2020 and the Billion Dollar Roundtable – resources that are ready to support female entrepreneurs and women-owned businesses of all types to get to the next level. I can’t wait to see what the Billion Dollars Funders Circle – announced today – results in. Perhaps the next inspiring speaker at SXSWi 2018? My South by started on an inspirational note, hearing from 23-year-old journalist Noor Tagouri. Overcoming societal prejudices has been extremely challenging for Tagouri, but has also opened the door for a fresh take on storytelling and her approach to the profession of journalism. The impactful takeaway, of course, is taking time (even if a few hours at a time) to approach your work, or even your life with a new and completely different perspective and see what successes it might lead to. My most anticipated session of the day was hearing from Nike, Airbnb, Pinterest and IBM professionals about how each company has set aside physical space for their employees to “make things.” (here’s a visual tour of Nike’s space) From screen printing studios to sewing labs and the development of “welcome swag” for new hires, spaces for making have increased productivity, boosted the creative process and even created a place for collaborative projects and workshops with customers. At a conference that focuses on technology and all things digital, its amazing what can happen when we step away from screens and work with our hands for a little while each day.